Today I’m excited to bring back a feature of my blog that I haven’t done in a long time. That is, to bring back some of my drawings. Since my favorite vegan sandwich happens to be something I can no longer eat due to being gluten free (well, who am I kidding, I don’t really eat sandwiches anymore, which makes me sad!) I couldn’t just snap a fresh picture of it. Adding to problem, is that this sandwich is from a local vegetarian/vegan restaurant in my state. So, I wasn’t going to go there, and buy something I can’t even eat just to get a good picture of it. No, that’d be pure torture. 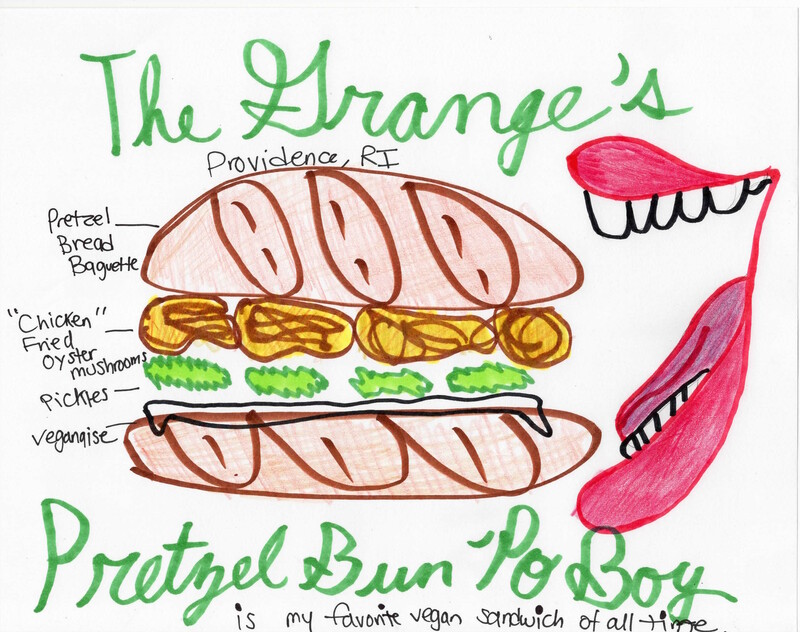 So instead, I drew a picture in homage of this sandwich. It’s from a restaurant called The Grange. If you’re ever visiting Providence, I recommend you go to it. And get in touch with me, I’ll happily meet up with you and we can talk about vegan (and also vegan gluten free, if you’re into that!?) food the whole time. They have really great brunches. Just sayin’. The picture I drew basically describes it perfectly, although it is hard to describe the oyster mushrooms to do them any justice. The salty and smooth pretzel baguette along with the veganaise (which I guess, according to the menu is actually “remoulade”, house made pickles (or at least I assume they are, they’re good, and taste almost homemade), and mushrooms makes the perfect combination for a sandwich. I seriously would do almost anything to make myself be able to eat gluten again so I could have one more of these. Alas… 😦 I will need to find a new favorite dish that is also gluten free at this awesome restaurant. Oh fried oyster mushrooms in a pretzl bun would be sooo good! I hope you can find a similar gluten free alternative, great drawing! I love your illustration! That does look like an awesome sandwich, although I’ve never tried fried oyster mushrooms…sounds interesting! ← Vegan Mofo Day 4: Post #4: My blog’s 2 year anniversary is today!